Will it work this time. Kinda takes the edge off. Great pic and amusing. Thanks for not copyrighting it. I never knew which person was which. While I have seen them many times, I don’t actually know where they are……somewhere between Bourke and Collins. hmmm Actually I’m not quite sure which is which. They’re in the Royal Arcade, between Bourke and Little Collins Sts. 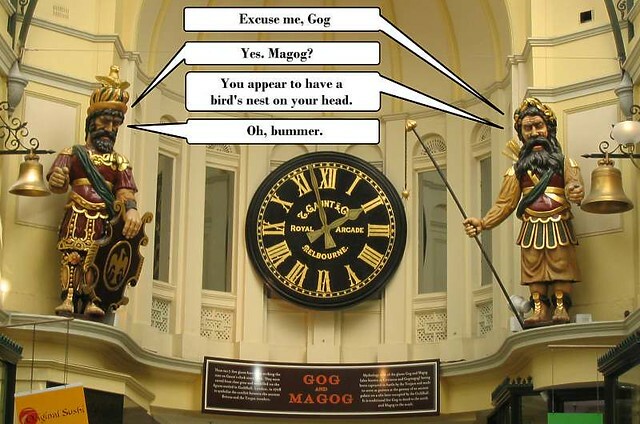 So, England isn’t the only place with a Gog and Magog (near where I live, there’s a couple of hills with those names).